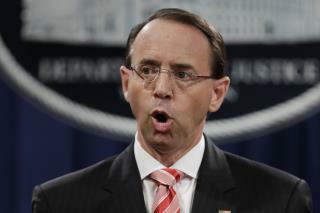 (Newser) – The man who appointed Robert Mueller to head the Russia investigation is expected to leave the Department of Justice in the coming weeks, sources tell nearly every major media outlet. Deputy Attorney General Rod Rosenstein has reportedly conveyed his plans to the White House, which ABC News reports is not pushing him out. The timeline is said to revolve around the confirmation of Trump's nominee for attorney general, William Barr. CNN reports Barr's Senate confirmation hearings start Tuesday; a confirmation vote would likely take place around mid-February. If the vote goes Barr's way, Rosenstein is then expected to leave, though the timing of naming of a new deputy attorney general could also impact things. so make sure his handcuffs are in the front so when they take him outside he photographs well!